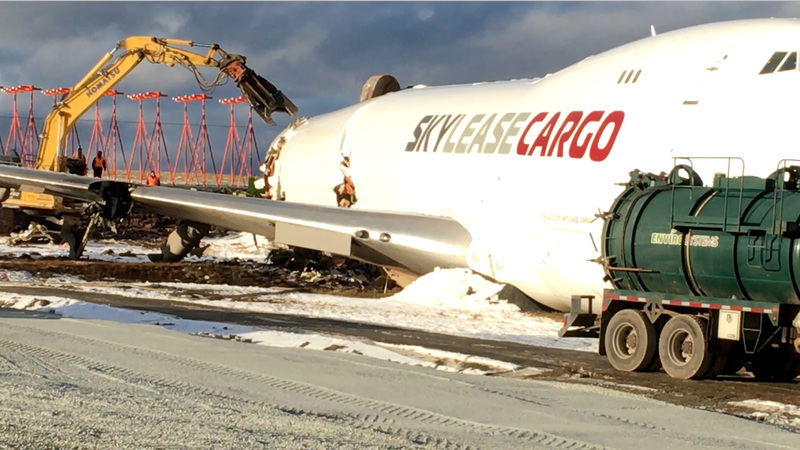 Construction crews have removed the tail end of the 747 cargo plane that overshot a runway at Halifax Stanfield International Airport last week. Three machines dug into the back of the plane with mechanical claws Saturday, tearing the body of the jumbo jet apart behind the wings. After 30 minutes, the plane was in two pieces. Theresa Spicer, spokesperson for the airport authority, said the removal was set to begin on Friday, but was delayed due to snowy weather. “They’ll begin by stripping the tail and the wings,” she said Saturday, noting the work will continue through the weekend. 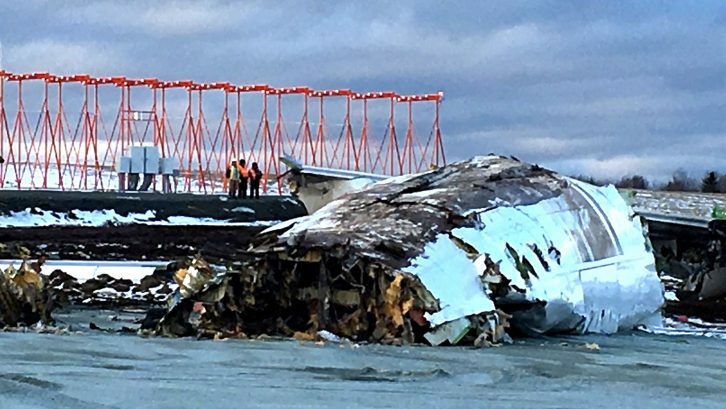 The Boeing 747-400 cargo plane arriving from Chicago went off Runway 14 at the Halifax airport on Nov. 7. High winds were cited as a possible factor in a botched landing that sent four crew to hospital with non-life threatening injuries, according to the Transportation Safety Board of Canada. At a news conference on Nov. 8, Austin Adams, investigator with the safety board, said planes usually try to land into the wind, but that didn’t happen in this case. Even with elevated winds and the added tailwind, Adams said many factors were at play and it was too early to draw conclusions. Runway 14 is the shorter of two runways at the airport. It runs 7,700 feet, or 2.34 kilometres. The safety board is unsure if the plane was directed by air traffic control to land on that specific runway, though the preliminary investigation suggested it was the pilot’s choice. The plane belongs to American transport company SkyCargo, which could not be reached for comment.